The world's most beautiful city, the most inspiring cultural treasures, and magnificent scenery: Nowhere else in the world will you find a bigger concentration of beauty. There's Venice, Florence and Rome with their varied architecture, the natural masterpiece that is Tuscany with its rolling hills, vineyards and snow-peaked mountains. 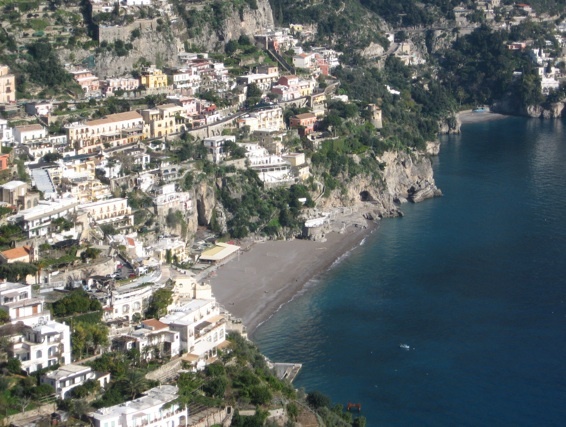 Then there's the perfect naturalist painting that is the Amalfi Coast or Lake Maggiore and the Alps and you get the sense that no country on Earth offers as much beauty anywhere you turn as Italy. The most common image of Spain is of the dreadful overdevelopment of the Costa del Sol or of the coastline of some of the Balearic Islands, but Spain is so much more than that. It's perhaps the most diverse country in the world, with everything from white Mediterranean villages to sophisticated urban centers. You won't find a city with a greater sense of individuality than Barcelona, and from the Pyrenees to Andalusia, Spain could serve as the backdrop for any kind of film, book or painting. It's also the world's most seductive country, passionate about living the good life reflected on grand plazas in even the smaller cities, in well-preserved historic centers, and in the smallest of villages perched on hilltops. 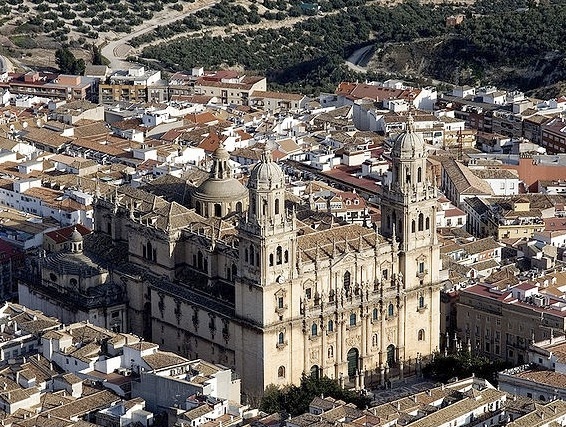 To top it all off, there are some of the world's grandest, most powerful and incomparable architectural treasures, from the Alhambra to the Great Mosque of Cordoba. Paris exudes the most perfect atmosphere of cultural grandeur but although the capital gets all the attention, France offers so much more. 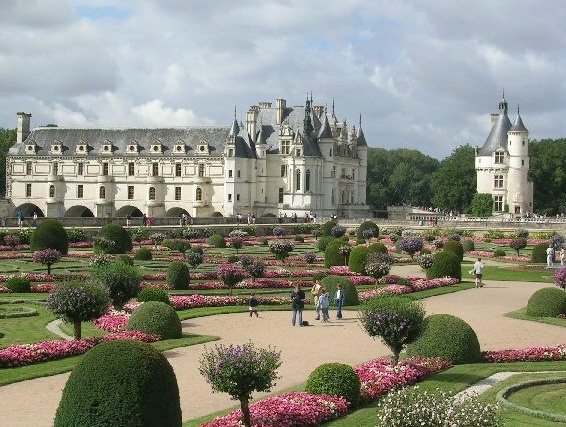 Villages with abundant Old World charm are all over the country, from around the magnificent Loire Valley to verdant Provence. Then there's the glamorous Riviera and if you want to see the world's greatest palace (Versailles) and museum (the Louvre), here they are. 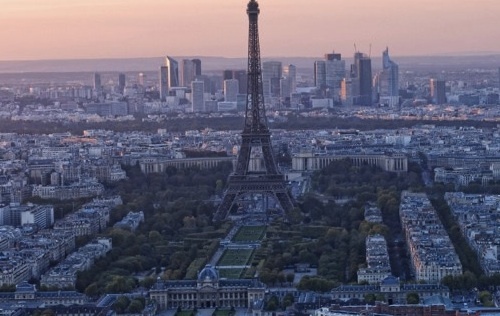 But France is also a country of world-class living in outdoor cafes, in perfectly-preserved towns and in wine-producing regions such as Bordeaux and Champagne. If that's not enough, see the majesty of Mont St. Michel, the numerous chateaux all over the country and the spectacular panorama of the Chamonix valley. Australia is more than a country, it's a continent and still more than that. 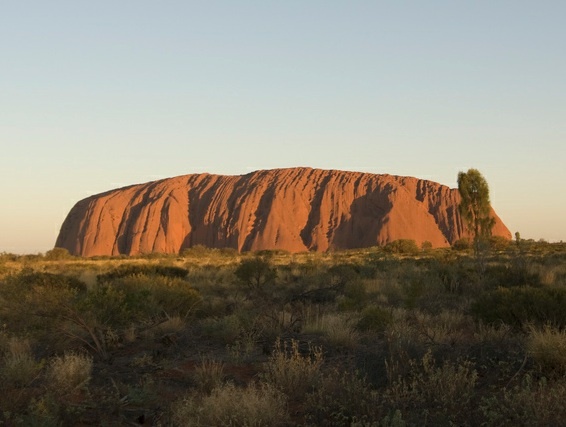 It's its own world, from the Outback and the Uluru-Kata Tjuta National Park with its world-renowned stone monolith to the Kakadu National Park. It's in fact wild parks and a wide range of landscapes that make Australia so extraordinary, from the Mornington Peninsula National Park facing the open sea to the Great Barrier Reef that's one of the natural wonders of the world, to the unspoiled tropical Whitsunday Islands, but then there's Sydney and its harbor, one of the most beautiful and iconic urban areas. Australia has it all, to be admired before or after a ride down the Great Ocean Road. 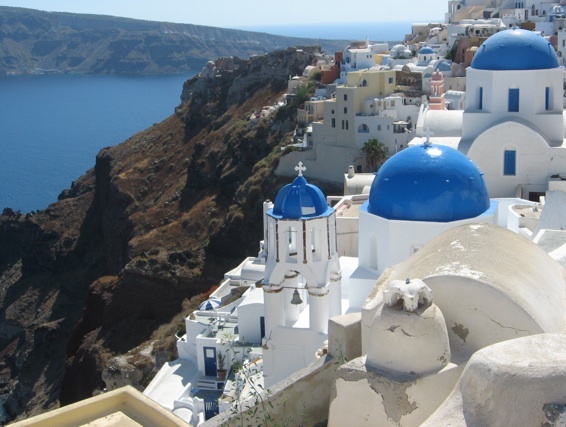 The Greek Islands on the blue waters of the Aegean Sea are home to some of the world's most beautiful beaches. They're the first images of the country but then there's the majestic Mt. Olympus, extraordinary Meteora, and ancient ruins around the country. While Athens disappoints those looking for aesthetic inspiration, Greece is a country that truly satisfies all the senses and it's understandable how the idea of so many gods originated here. For the pristine natural wonders of the volcanic Azores alone, Portugal would be on this list. 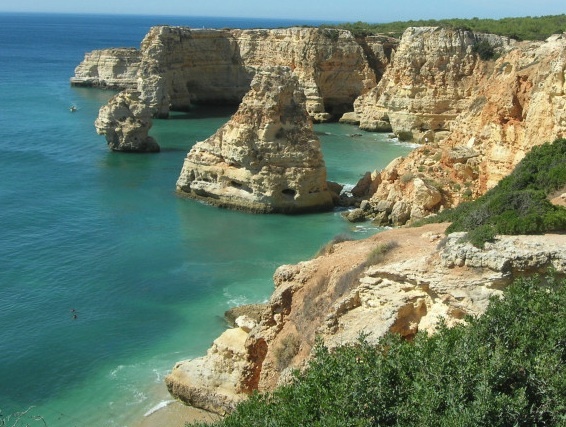 Then there's the "floating garden" that is Madeira, the dramatic coastline and mystical capes of the mainland, the serene plains of the Alentejo with the stunningly-sited white medieval vilages of Marvão and Monsaraz, the Peneda-Gerês National Park, or the perfect collaboration of man and nature in the magic fantasy of Sintra and verdant Douro Valley. And while the old centers of Lisbon and Porto are inexplicably rundown and stubbornly neglected, it's hard to match their scenic beauty with their grand riverside settings. Everything is in a small scale but when all combined it's impressive how so much diverse beauty somehow fits in such a tiny country that seems to be a favorite of the sun. It has the ugliest cities in the developed world linked by shopping mall roads of fast food joints, car lots, billboards, cheap hotels and soulless suburbs (with populations obliviously living the American nightmare), but when it comes to nature, America really is the beautiful. There are the Hawaiian islands, the epic scale of the Grand Canyon, the extraordinarily clear waters of Lake Tahoe, California's Big Sur, the wildlife in Alaska, the breathtaking scenery of Monument Valley or of Yellowstone, Yosemite and the other great national parks, the forestland of the Great Smoky Mountains... The list of natural wonders seems to go on forever and then there's San Francisco to save the country on the offer of beauty in an urban setting. It has one of the world's most beautiful cities (Rio de Janeiro) and one of the ugliest(São Paulo) but Brazil really is blessed by nature. The Amazon is incomparable, impossible to begin to imagine its magnitude, and the horseshoe-shaped falls of Iguaçu regularly watched by a rainbow is one of the world's most breathtaking sights. The colonial baroque architecture of the northeast with their golden interiors mixed with singular traditions give it one of the world's most soulful atmospheres, and if the country's other major cities weren't so bland (Brasilia, Belo Horizonte, Curitiba, Fortaleza, Manaus, etc. ), Brazil would actually rank higher on this list. Cape Town is one of the world's most beautiful cities (let's just say it's number 11 on our top 10 list), and the Kruger National Park is one of the most memorable experiences on the planet for anyone who visits. 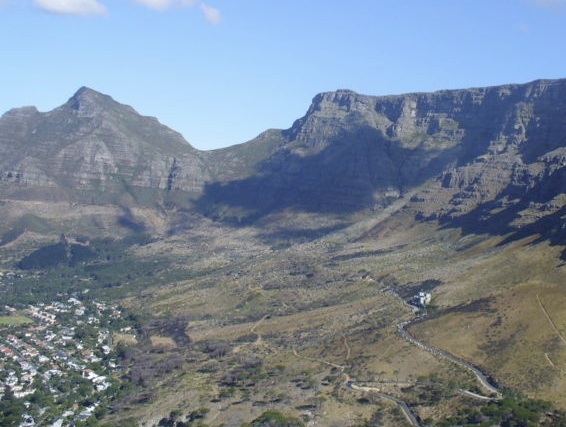 South Africa offers epic diversity of landscapes, from the Blyde River Canyon to the Drakensberg Mountains. With all of that it's almost easy to forget that it's also a country full of problems with a capital city that is best avoided, but escape to the Cape and grab your camera to photograph all in between and you'll be savoring one of the most awe-inspiring territories on the planet. Yes, Germany. Perhaps the world's most underrated country, Germany is a place of fairytales and architectural jewels. They're not necessarily found in the largest cities (Berlin, Frankfurt, Hamburg, or Cologne which are more vibrant than beautiful) but Munich has its charms and smaller cities such as Dresden, Leipzig and Potsdam have been preserved or restored to fairytale eye candy. 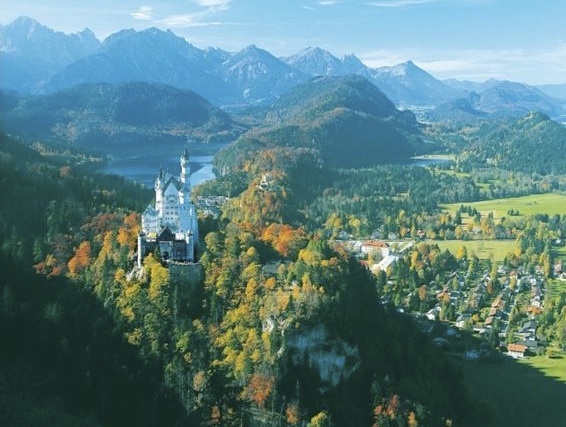 But the real storybook Germany is found all along Bavaria's Romantic Road with its wealth of unbelievable castles, in the Alps' gorgeous lakes and mountains, in the magical land of the Rhine with its vineyards or in the enchanting Black Forest. Begin to tour the country and you'll discover a land of constant surprises, from the university city of Heidelberg, to old Bremen or Bamberg, to the wonderfully preserved medieval towns of Regensburg and Rothenburg. Among those who've seen it in person, the conclusion is unanimous: Venice is the most beautiful city in the world, and the only one that can truly be described as unique. Each building is a work of art, with their beauty enhanced when reflected on the canals that cross the city. Its magical scenery is fascinating and breathtaking at first sight, evoking the feeling of entering the setting of a real-life fairy tale. 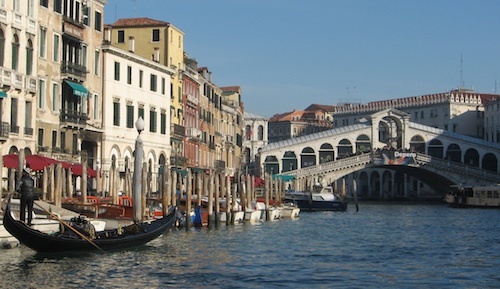 It's perhaps even unfair to all other cities to call Venice a city, as it is a place unlike any other, that no other can compare to, or ever be like. The Seine and the bridges that cross it, the grand boulevards, the monumental squares, the magnificent monuments, the charming streets of Montmartre -- these images of Paris confirm that it is indeed the most elegant and sophisticated of all cities. It has inspired practically every major world capital, with every city claiming its own Champs-Elysèes, and Place des Vosges becoming the prototype of residential squares throughout Europe. Sit at an outdoor café table or go on a boat tour of the Seine and see it all romantically flash before your eyes. It is known as the city of the thousand spires because of its profusion of grand, beautifully-preserved historical monuments dating from practically every period in history. 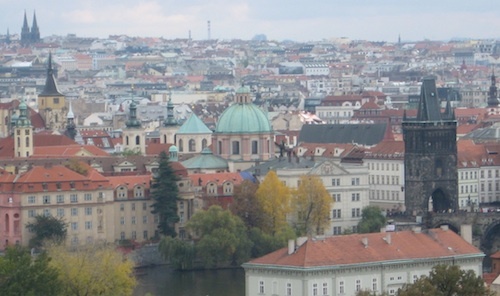 Those spires are best admired from the bridges that cross the Vltava River, especially from the magnificent Charles Bridge, or standing in the stunningly beautiful Old Town Square. Add the atmospheric alleyways and cobbled streets that lead to it, and you know that few other cities delight the senses as much as Prague. 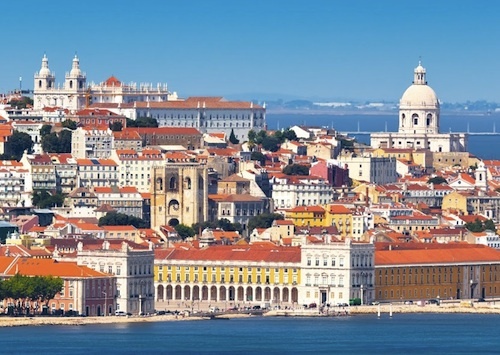 Magnificently sited on a series of hills running down to the grand Tagus River, Lisbon is one of the world's most scenic cities. Beautiful unexpected views are found at every turn down its colorful, picturesque streets, and especially from strategically-placed viewpoints or terraces at the top of each hill. The city has an unpolished, seductive appearance; an effortless beauty with captivating details such as cobbled designs, tiled façades, and pastel-colored buildings blending together to give it a singular atmosphere now lost in so many other cities. In such a stunning place, it's no wonder that many of the world's great explorers questioned what other beauties lied beyond the horizon when they departed from here in the 15th century. 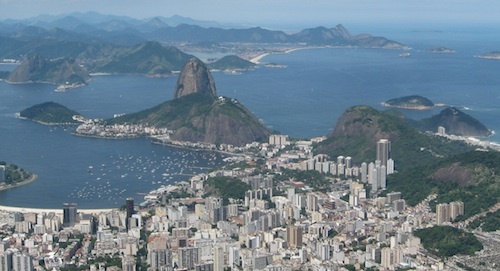 There are those who say God created the world in six days and devoted a seventh to Rio. The city is indeed blessed with one of the most stunning settings in the world, making it the most naturally beautiful city in the world. 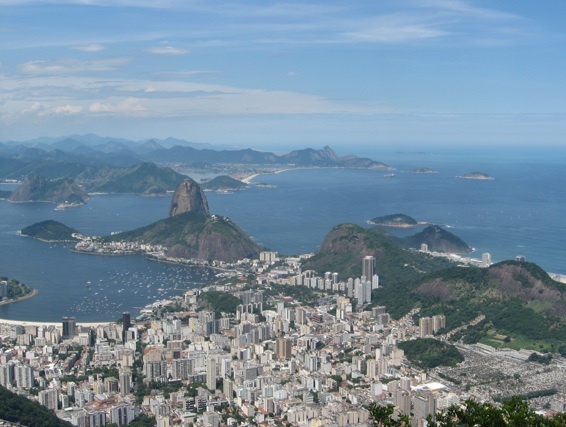 Even if it was deserted of buildings and population, anyone standing at the top of the famous Sugarloaf Mountain or by the Corcovado statue would see one of the world's most beautiful landscapes. Green, tropical luxuriance mixes with the blue of the ocean and the brightness of the sand at the beaches, proving that this is indeed "the marvelous city" as locals call it. 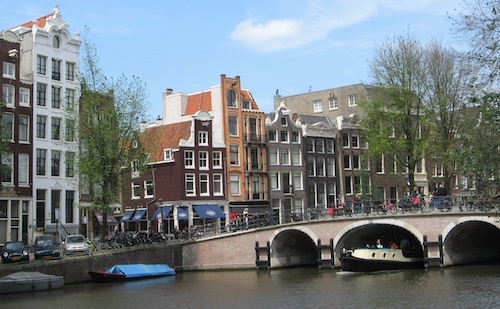 Each of the thousands of buildings that line Amsterdam's main canals can be classified as a monument, beautifully kept as apartments, offices, cafés, restaurants, and even brothels. All together they form an aesthetic uniformity that make the city one of the most charming in the world, a stunning place of bridges and bikes crossing canals, picturesque cobbled streets, and strikingly elegant architecture. Florence is synonymous with the Italian Renaissance, known for the artistic heritage in its palaces and museum collections. Yet with all the beauty both inside and outside its palazzi's walls, it is the city as a whole that impresses the most. See it from Piazzale Michelangelo, a 19th century terrace overlooking the entire city, and you'll be looking at one of the most storybook-perfect cityscapes. You'll see its unspoiled skyline, the towers and domes of the heart of the city, its bridges, the hills in the distance, and the magnificent Duomo standing in the middle of it all. 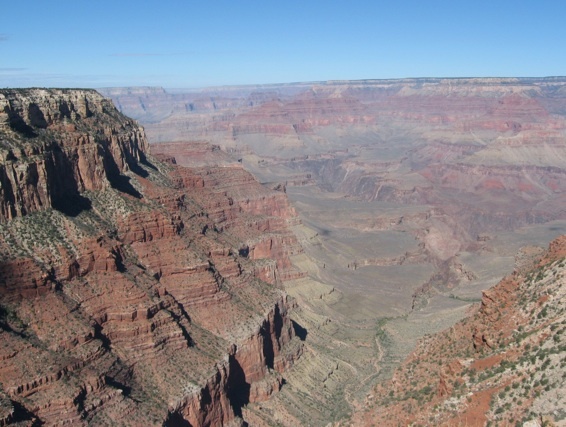 Few other places in the world will leave you as awestruck. 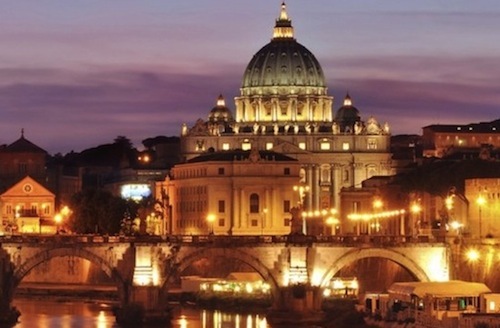 The city standing on seven hills by the Tiber River is a treasure-trove of monuments among some of the most beautiful squares and classical architecture in the world. Because everyone visits Rome for its landmarks, its picturesque streets are often overlooked, such as those of the Trastevere district, filled with charming lanes, faded palazzi, and lovely homes decorated with flower boxes. It is on streets like those that Rome proves itself to really be eternal. 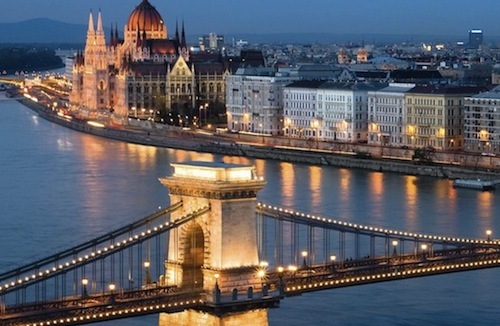 Split in two by the Danube River, Budapest is the result of the merging of three cities. Buda is the hill with the royal palace and an old town filled with baroque and gothic monuments looking over the mostly-19th century Pest, crossed by broad avenues lined with elegant neo-renaissance buildings. Admire its setting and remarkable architecture (including the stunning Parliament Building) from the monumental Chain Bridge, and step into the old town for some of the most romantic lanes you'll ever stroll through. It's a small city, in a small country, hardly a metropolis, but huge on beauty. It's one of the world's best preserved medieval cities, filled with gothic and baroque monuments surrounded by an oval canal and extraordinarily romantic cobbled lanes. It's no wonder that it is one of Europe's most visited cities, helped by its location in the very center of the continent. 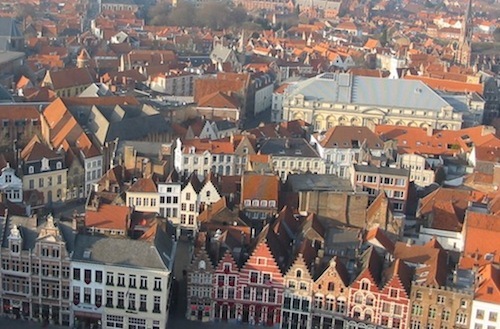 It's an unmissable destination when in Brussels, and easily accessible from anywhere in central Europe. Its combination of gorgeous architecture and pretty, peaceful spots crisscrossed by canals make it one of the most magical sites to be experienced in the world. Fifa 16 release date will be 23rd September, 2015. Women Teams will be also included in the latest Fifa 15. The platforms for the game will be PlayStation 4, PlayStation 3, Xbox One,Xbox 360, Android, IOS & Microsoft Windows. Call of Duty: Black Ops III release date will be 6th November, 2015. The platforms for the game will be PlayStation 4, PlayStation 3, Xbox 360, Xbox One & Microsoft Windows. Forza Motorsport 6 release date will be 15th September, 2015. The platform for the game will only be Xbox One. Just Cause 3 will release in 2015. The platforms for the game will be PlayStation 4, Xbox One & Microsoft Windows. Minecraft: Story Mode will release in 2015. The platforms for the game will be PlayStation 4, Xbox One, Android, Xbox 360, PlayStation Vita, PlayStation 3, IOS & Mac OS. Mortal Combat X will release in 2015. The platforms for the game will be PlayStation 4, Android, PlayStation 3, Xbox One, IOS, Xbox 360 & Microsoft Windows. Fable Legends will release in 2015. The platforms for the game will be Xbox One & Microsoft Windows. Naruto Shippuden: Ultimate Ninja Storm 4 will release in 2015. The platforms for the game will be PlayStation 4, Xbox One & Microsoft Windows. Volume release date will be 18th August, 2015. The platforms for the game will be PlayStation 4, PlayStation Vita, Microsoft Windows & Mac OS. Mad Max release date will be 1st September, 2015. The platforms for the game will be PlayStation 4, Xbox One, Microsoft Windows & GNU/Linux. Until Dawn will release in 2015. The platform for the game will only be PlayStation 4. A blog or web log is a personal web site made up of usually short, frequently updated posts that are arranged chronologically. The content and purposes of blogs varies greatly from links and commentary about other web sites to observations about news or politics, diaries, photos, poetry, essays, project updates, even fiction. Blogs are a fast growing segment of the web. An article in the August 26, 2002 Newsweekestimated the number of blogs at 500,000 with a new one coming online every forty seconds. You have a personal computer with a connection to the Internet. You have a personal email account. You have a moderate amount of experience using the World Wide Web. It is not necessary to know html to maintain a blog, but it is helpful if you want to customize it. We will use the free web-based publishing Blogger and the free blog hosting service Blogspot. 1.) Go to the web site www.blogger.com. On the right hand side of the page, about half way down you will see a blue box that says, “Sign Up”. In the corresponding blanks, enter a username and password for yourself. Confirm your password. NOTE: Remember your username and password. Write them down if necessary. 2.) In the next screen enter your first and last name and your email address. Then click the link to read the Terms of Service, and click the checkbox indicating that you have. After entering this information, you will return to the Blogger.com home page as a logged in user. 3.) On the right hand side of the home page you will see a blue box that says, “Your Blogs”. To start your blog, click where it says “Create a new blog” in the blue box. After your blog has been created, you will return here to update it. 4.) You are now at a screen that prompts you to enter a title and brief description of your blog. Also it will ask you if you want this to be a public blog. Enter your title, enter your description, choose public or not, click next. A “public blog” will be listed in the Blogger directory and might appear on the recently updated list on the blogger.com home page. If you choose no, your “Private Blog” will still be viewable to anyone on the internet. 5.) You are now given the option of hosting your blog at Blogspot or using Blogger to update a website hosted elsewhere.Make sure that “Host it at Blogspot.” Is selected and click next. Remember this address. Write it down if necessary. Enter the address you would like to use in the appropriate blank, click the checkbox next to “I accept the Blogspot terms of service” and click next. 7.) This screen offers you a selection of eight templates for your blog. The template determines what your website will look like. Select one of the templates and click “Finished.” Select one of these eight right now, but you can change at any time to one of the many other templates available or even create a custom one of your own. 8.) Now you are at the Blogger interface that you will use to update your blog from now on. On this first visit, the following instructions will appear on the bottom half of the screen. I have copied and pasted them here for future reference. Posting: Enter text and/or HTML in the form field above and hit the post button in the upper right. All posts will show up here. Editing: All posts that you have permission to edit (which is all posts created by you, or, if you're an administrator of a collaborative blog, all posts) will appear with an  link. To get to older posts that are not showing up in this frame, use the filter form on the right. This filter will not effect what appears on your actual blog page. Birds (class Aves) are feathered, winged, two-legged, warm-blooded, egg-laying vertebrates. Birds are characterised by feathers, a beak with no teeth, the laying of hard-shelled eggs, a high metabolic rate, a four-chambered heart, and a lightweight but strong skeleton. Birds have more or less developed wings; the only known species without wings was the moa, which is generally considered to have become extinct in the 16th century. Wings are evolved forelimbs, and most bird species can fly. Flightless birdsinclude ratites, penguins, and diverse endemic island species. Some species of birds, particularly penguins and members of the duck family, are adapted for swimming. Birds also have digestive and respiratory systems that are uniquely adapted for flight. Some birds, especially corvids and parrots, are among the most intelligent animals; several bird species make and use tools, and many social species pass on knowledge across generations, which is considered a form of culture. Many species annually migrate great distances. Birds are social, communicating with visual signals, calls, and songs, and participating in such social behaviours as cooperative breeding and hunting, flocking, and mobbing of predators. The vast majority of bird species are socially monogamous, usually for one breeding season at a time, sometimes for years, but rarely for life. Other species have polygynous ("many females") or, rarely, polyandrous ("many males") breeding systems. Eggs are usually laid in a nest andincubated by the parents. Most birds have an extended period of parental care after hatching. Many species are economically important. Domesticated and undomesticated birds (poultry and game) are important sources of eggs, meat, and feathers. Songbirds, parrots, and other species are popular as pets. Guano (bird excrement) is harvested for use as a fertilizer. Birds prominently figure throughout human culture. About 120–130 species have become extinct due to human activity since the 17th century, and hundreds more before then. Human activity threatens about 1,200 bird species with extinction, though efforts are underway to protect them. Recreational birdwatching is an important part of the ecotourism industry. Aves ranks as the tetrapod class with the most living species, approximately ten thousand. Birds live worldwide and ranging in size from the 5 cm (2 in) bee hummingbird to the 2.75 m (9 ft) ostrich. The fossil record indicates that true birds first appeared during the Cretaceous period, around 100 million years ago. The current scientific consensus is that birds are theropod dinosaurs. DefinitionThe first classification of birds was developed by Francis Willughby and John Ray in their 1676 volume Ornithologiae. Carolus Linnaeus modified that work in 1758 to devise the taxonomic classification system currently in use. Birds are categorised as the biological class Aves in Linnaean taxonomy. Phylogenetic taxonomy places Aves in the dinosaur clade Theropoda. Under the fourth definition Archaeopteryx is an avialan, and not a member of Aves. Gauthier's proposals have been adopted by many researchers in the field of paleontology and bird evolution, though the exact definitions applied have been inconsistent. Avialae, initially proposed to replace the traditional fossil content of Aves, is often used synonymously with the vernacular term "bird" by these researchers. Most researchers define Avialae as branch-based clade, though definitions vary. Many authors have used a definition similar to "all theropods closer to birds than to Deinonychus. Avialae is also occasionally defined as an apomorphy-based clade (that is, one based on physical characteristics). Jacques Gauthier, who named Avialae in 1986, re-defined it in 2001 as all dinosaurs that possessed feathered wings used in flapping flight, and the birds that descended from them. Dinosaurs are a diverse group of animals of the clade Dinosauria. They first appeared during the Triassic period, 231.4 million years ago, and were the dominant terrestrial vertebrates for 135 million years, from the beginning of the Jurassic (about 201 million years ago) until the end of the Cretaceous (66 million years ago), when the Cretaceous–Paleogene extinction event led to the extinction of most dinosaur groups at the close of the Mesozoic Era. The fossil record indicates that birds evolved from theropod dinosaurs during the Jurassic Period and, consequently, they are considered a subgroup of dinosaurs by many paleontologists. Some birds survived the extinction event that occurred 66 million years ago, and their descendants continue the dinosaur lineage to the present day. Dinosaurs are a varied group of animals from taxonomic, morphological and ecological standpoints. Birds, at over 10,000 living species, are the most diverse group of vertebrates besides perciform fish. Using fossil evidence, paleontologists have identified over 500 distinct genera and more than 1,000 different species of non-avian dinosaurs. Dinosaurs are represented on every continent by both extant species and fossil remains. Some are herbivorous, others carnivorous. While dinosaurs were ancestrally bipedal, many extinct groups included quadrupedal species, and some were able to shift between these stances. Elaborate display structures such as horns or crests are common to all dinosaur groups, and some extinct groups developed skeletal modifications such as bony armor and spines. Evidence suggests that egg laying and nest building are additional traits shared by all dinosaurs. While modern dinosaurs (birds) are generally small due to the constraints of flight, many prehistoric dinosaurs were large-bodied—the largest sauropod dinosaurs may have achieved lengths of 58 meters (190 feet) and heights of 9.25 meters (30 feet 4 inches). Still, the idea that non-avian dinosaurs were uniformly gigantic is a misconception based on preservation bias, as large, sturdy bones are more likely to last until they are fossilized. 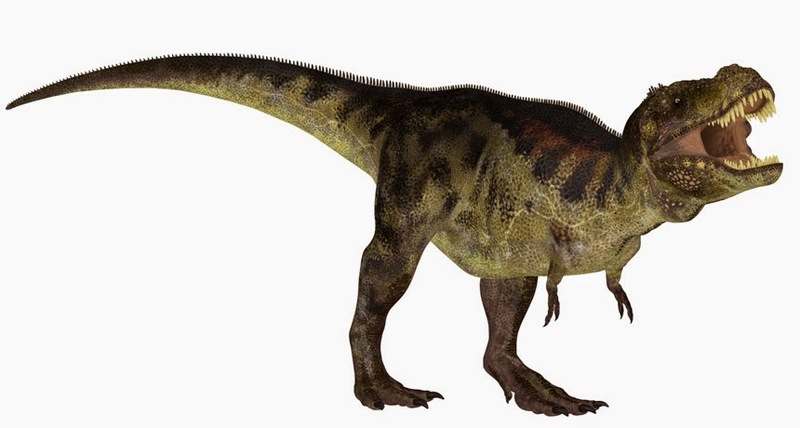 Many dinosaurs were quite small: Xixianykus, for example, was only about 50 cm (20 in) long. Although the word dinosaur means "terrible lizard", the name is somewhat misleading, as dinosaurs are not lizards. Instead, they represent a separate group of reptiles that, like many extinct forms, did not exhibit characteristics traditionally seen as reptilian, such as a sprawling limb posture or ectothermy. Additionally, many prehistoric animals, including mosasaurs, ichthyosaurs, pterosaurs, plesiosaurs, and Dimetrodon, are popularly conceived of as dinosaurs, but are not taxonomically classified as dinosaurs. Through the first half of the 20th century, before birds were recognized to be dinosaurs, most of the scientific community believed dinosaurs to have been sluggish and cold-blooded. Most research conducted since the 1970s, however, has indicated that all dinosaurs were active animals with elevatedmetabolisms and numerous adaptations for social interaction. Since the first dinosaur fossils were recognized in the early 19th century, mounted fossil dinosaur skeletons have been major attractions at museums around the world, and dinosaurs have become an enduring part of world culture. The large sizes of some groups, as well as their seemingly monstrous and fantastic nature, have ensured dinosaurs' regular appearance in best-selling books and films, such as Jurassic Park. Persistent public enthusiasm for the animals has resulted in significant funding for dinosaur science, and new discoveries are regularly covered by the media. The taxon Dinosauria was formally named in 1842 by paleontologist Sir Richard Owen, who used it to refer to the "distinct tribe or sub-order of Saurian Reptiles" that were then being recognized in England and around the world. The term is derived from the Greek words δεινός (deinos, meaning "terrible," "potent," or "fearfully great") and σαῦρος (sauros, meaning "lizard" or "reptile"). Though the taxonomic name has often been interpreted as a reference to dinosaurs' teeth, claws, and other fearsome characteristics, Owen intended it merely to evoke their size and majesty. Birds are now recognized as being the sole surviving lineage of theropod dinosaurs. In traditional taxonomy, birds were considered a separate class that had evolved from dinosaurs, a distinct superorder. However, a majority of contemporary paleontologists concerned with dinosaurs reject the traditional style of classification in favor ofphylogenetic nomenclature; this approach requires that, for a group to be natural, all descendants of members of the group must be included in the group as well. Birds are thus considered to be dinosaurs and dinosaurs are, therefore, not extinct. Birds are classified as belonging to the subgroup Maniraptora, which are coelurosaurs, which are theropods, which are saurischians, which are dinosaurs. Under phylogenetic taxonomy, dinosaurs are usually defined as the group consisting of Triceratops, Neornithes [modern birds], their most recent common ancestor (MRCA), and all descendants. It has also been suggested that Dinosauria be defined with respect to the MRCA of Megalosaurus and Iguanodon, because these were two of the three genera cited by Richard Owen when he recognized the Dinosauria. Both definitions result in the same set of animals being defined as dinosaurs: "Dinosauria =Ornithischia + Saurischia", encompassing theropods (mostly bipedal carnivores and birds), ankylosaurians (armored herbivorous quadrupeds), stegosaurians (plated herbivorous quadrupeds), ceratopsians (herbivorous quadrupeds with horns and frills), ornithopods (bipedal or quadrupedal herbivores including "duck-bills"), and sauropodomorphs (mostly large herbivorous quadrupeds with long necks and tails). Using one of the above definitions, dinosaurs can be generally described as archosaurs with hind limbs held erect beneath the body. Many prehistoric animal groups are popularly conceived of as dinosaurs, such as ichthyosaurs, mosasaurs, plesiosaurs, pterosaurs, and Dimetrodon, but are not classified scientifically as dinosaurs, and none had the erect hind limb posture characteristic of true dinosaurs. Dinosaurs were the dominant terrestrial vertebrates of the Mesozoic, especially the Jurassic and Cretaceous periods. Other groups of animals were restricted in size and niches; mammals, for example, rarely exceeded the size of a cat, and were generally rodent-sized carnivores of small prey. Dinosaurs have always been an extremely varied group of animals; according to a 2006 study, over 500 non-avialan dinosaur genera have been identified with certainty so far, and the total number of genera preserved in the fossil record has been estimated at around 1850, nearly 75% of which remain to be discovered. An earlier study predicted that about 3400 dinosaur genera existed, including many which would not have been preserved in the fossil record. By September 17, 2008, 1047 different species of dinosaurs had been named. Some are herbivorous, others carnivorous, including seed-eaters, fish-eaters, insectivores, and omnivores. While dinosaurs were ancestrally bipedal (as are all modern birds), some prehistoric species were quadrupeds, and others, such as Ammosaurus and Iguanodon, could walk just as easily on two or four legs. Cranial modifications like horns and crests are common dinosaurian traits, and some extinct species had bony armor. Although known for large size, many Mesozoic dinosaurs were human-sized or smaller, and modern birds are generally small in size. Dinosaurs today inhabit every continent, and fossils show that they had achieved global distribution by at least the early Jurassic period. Modern birds inhabit most available habitats, from terrestrial to marine, and there is evidence that some non-avialan dinosaurs (such as Microraptor) could fly or at least glide, and others, such as spinosaurids, had semi-aquatic habits. While recent discoveries have made it more difficult to present a universally agreed-upon list of dinosaurs' distinguishing features, nearly all dinosaurs discovered so far share certain modifications to the ancestralar chosaurian skeleton, or are clear descendants of older dinosaurs showing these modifications. Although some later groups of dinosaurs featured further modified versions of these traits, they are considered typical for Dinosauria; the earliest dinosaurs had them and passed them on to their descendants. Such modifications, originating in the last common ancestor of a certain taxonomic group, are called the synapomorphies of such a group. Macaws are long-tailed, often colourful New World parrots. 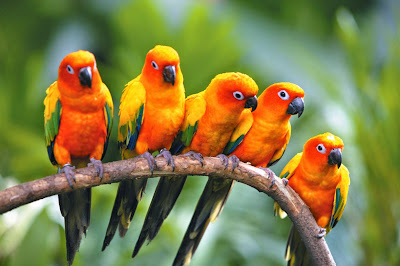 Of the many different Psittacidae (true parrots) genera, six are classified as macaws: Ara,Anodorhynchus, Cyanopsitta, Primolius, Orthopsittaca, and Diopsittaca. Previously, the members of the genus Primolius were placed in Propyrrhura, but the former is correct in accordance with ICZN rules. Macaws are native to Central America (especially Mexico), South America, and formerly the Caribbean. Most species are associated with forests, especially rainforests, but others prefer woodland or savannah-like habitats. Proportionately larger beaks, long tails, and relatively bare, light-coloured, medial (facial patch) areas distinguish macaws from other parrots. Sometimes the facial patch is smaller in some species, and limited to a yellow patch around the eyes and a second patch near the base of the beak in the members of the genusAnodorhynchus. A macaw's facial feather pattern is as unique as a fingerprint. The largest macaws are the hyacinth, Buffon's (great green) and green-winged macaws. While still relatively large, macaws of the genera Cyanopsitta,Orthopsittaca and Primolius are significantly smaller than the members of Anodorhynchus and Ara. The smallest member of the family, the red-shouldered macaw, is no larger than some parakeets of the genus Aratinga. Macaws, like other parrots, toucans and woodpeckers, are zygodactyl, having their first and fourth toes pointing backward. International trade of all macaw species is regulated by the Convention on International Trade in Endangered Species of Wild Flora and Fauna (CITES). Some species of macaws—the scarlet macaw (Ara macao) as an example—are listed in the CITES Appendix I and may not be lawfully traded for commercial purposes. Other species, such as the red-shouldered macaw (Diopsittaca nobilis), are listed in Appendix II and may legally be traded commercially provided that certain controls are in place, including a non-detriment finding, establishment of an export quota, and issuing of export permits.The majority of macaws are now endangered in the wild and a few are extinct. The Spix's macaw is now probably extinct in the wild. The glaucous macaw is also probably extinct, with only two reliable records of sightings in the 20th century. The greatest problems threatening the macaw population are the rapid rate of deforestation and illegal trapping for the bird trade. Sometimes macaws are hybridized for the pet trade. Hybrids are typical macaws, with the only difference from true species being their genetics and their colours. Aviculturists have reported an over-abundance of female blue-and-yellow macaws in captivity, which differs from the general rule with captive macaws and other parrots, where the males are more abundant. This would explain why the blue and gold is the most commonly hybridised macaw, and why the hybridising trend took hold among macaws. Common macaw hybrids include the harlequin (Ara ararauna × Ara chloroptera), miligold macaw (Ara ararauna × Ara militaris and the Catalina (known as rainbows in Australia, Ara ararauna × Ara macao). In addition, unusual but apparently healthy intergeneric hybrids between the hyacinth macaw and several of the larger Ara macaws have also occasionally been seen in captivity. Some foods eaten by macaws in certain regions in the wild are said to contain toxic or caustic substances which they are able to digest. It has been suggested that parrots and macaws in the Amazon Basin eat clay from exposed river banks to neutralize these toxins. In the western Amazon hundreds of macaws and other parrots descend to exposed river banks to consume clay on an almost daily basis - except on rainy days. Donald Brightsmith, the principal investigator of the Tambopata Macaw Project, located at the Tambopata Research Center (TRC) in Peru, has studied the clay eating behaviour of parrots at clay licks in Peru. He and fellow investigators found that the soils macaws choose to consume at the clay licks do not have higher levels of cation-exchange capacity(ability to absorb toxins) than that of unused areas of the clay licks and thus the parrots could not be using the clay to neutralize ingested food toxins. Rather, the macaws and other bird and animal species prefer clays with higher levels of sodium. Sodium is a vital element that is scarce in environments greater than 100 kilometres from the ocean. The distribution of clay licks across South America further supports this hypothesis - as the largest and most species rich clay licks are found on the western side of the Amazon Basin far from oceanic influences. Salt-enriched (NaCl) oceanic aerosols are the main source of environmental sodium near coasts and this decreases drastically farther inland. Macaws eat a variety of foods including seeds, nuts, fruits, palm fruits, leaves, flowers, and stems. Wild species may forage widely, over 100 km (62 mi) for some of the larger species such as Ara araurana (blue and yellow macaw) and Ara ambigua (great green macaw), in search of seasonally available foods. Clay-eating behaviour by macaws is not seen outside the western Amazon region, even though macaws in these areas consume some toxic foods such as the seeds of Hura crepitans, or sandbox tree, which have toxic sap. Species of parrot that consume more seeds, which potentially have more toxins, do not use clay licks more than species that eat a greater proportion of flowers or fruit in their diets. Studies at TRC have shown a correlation between clay-lick use and the breeding season. Contents of nestling crop samples show a high percentage of clay fed to them by their parents. Calcium for egg development - another hypothesis - does not appear to be a reason for geophagy during this period as peak usage is after the hatching of eggs. Another theory is that the birds, as well as other herbivorous animals, use the clay licks as a source of cobalamin, otherwise known as vitamin B12. The budgerigar (Melopsittacus undulatus), also known as common pet parakeet or shell parakeet and informally nicknamed the budgie, is a small, long-tailed, seed-eating parrot. Budgerigars are the only species in the Australian genus Melopsittacus, and are found wild throughout the drier parts ofAustralia where the species has survived harsh inland conditions for the last five million years. Budgerigars are naturally green and yellow with black, scalloped markings on the nape, back, and wings, but have been bred in captivity with coloring in blues, whites, yellows, greys, and even with small crests. Budgerigars are popular pets around the world due to their small size, low cost, and ability to mimic human speech. The origin of the budgerigar's name is unclear. The species was first recorded in 1805, and today is the third most popular pet in the world, after the domesticated dog and cat. The budgerigar is closely related to the lories and the fig parrots. They are one of the parakeet species, a non-taxonomical term that refers to any of a number of small parrots with long, flat and tapered tails. In both captivity and the wild, budgerigars breed opportunistically and in pairs. Wild budgerigars are usually found to be mostly green in colour. Selective breeding, by breeders, over the years has caused changes in colour. Cage bred budgerigars are also larger in size than wild budgerigars. Breeding in the wild generally takes place between June and September in northern Australia and between August and January in the south, although budgerigars areopportunistic breeders and respond to rains when grass seeds become most abundant. They show signs of affection to their flockmates by preening or feeding one another. Budgerigars feed one another by eating the seeds themselves, and then regurgitating it into their flockmate's mouth. Populations in some areas have increased as a result of increased water availability at farms. Nests are made in holes in trees, fence posts, or logs lying on the ground; the four to six eggs are incubated for 18–21 days, with the young fledging about 30 days after hatching. In the wild, virtually all parrot species require a hollow tree or a hollow log as a nest site. Because of this natural behavior, budgerigars most easily breed in captivity when provided with a reasonable-sized nest box. The eggs are typically one to two centimetres long and are pearl white without any colouration if fertile. Female budgerigars can lay eggs without a male partner, but these unfertilised eggs will not hatch. When the female is laying eggs, her cere turns a crusty brown colour. A female budgerigar will lay hereggs on alternate days. After the first one, there is usually a two-day gap until the next. She will usually lay between four and eight eggs, which she will incubate (usually starting after laying her second or third) for about 21 days each. Females only leave their nests for very quick defecations, stretches and quick meals once they have begun incubating and are by then almost exclusively fed by their mate (usually at the nest's entrance). Females will not allow a male to enter the nest, unless he forces his way inside. Depending on the clutch size and the beginning of incubation, the age difference between the first and last hatchling can be anywhere from 9 to 16 days. At times, the parents may begin eating their own eggs due to feeling insecure in the nest box. Breeding difficulties arise for various reasons. Some chicks may die from diseases and attacks from adults. Other budgerigars (virtually always females) may fight over the nest box, attacking each other or a brood. Sometimes, budgerigars (mainly males) are not interested in the opposite gender, and will not reproduce with them; a flock setting—several pairs housed where they can see and hear each other—is necessary to stimulate breeding. Another problem may be the birds' beaks being under lapped, where the lower mandible is above the upper mandible. Most health issues and physical abnormalities in budgerigars are genetic. Care should be taken that birds used for breeding are active, healthy, and unrelated. Budgerigars that are related or which have fatty tumours or other potential genetic health problems should not be allowed to breed. Parasites (lice, mites, worms) and pathogens (bacteria, fungi and viruses), are contagious and thus transmitted between individuals through either direct or indirect contact. Nest boxes should be cleaned between uses. Splay leg is a relatively common problem in baby budgerigars and other birds; one the budgerigar's legs is bent outward, which prevents it from being able to stand properly and compete with the other chicks for food, and can also lead to difficulties in reproducing in adulthood. The condition is caused by young budgerigars slipping repeatedly on the floor of a nest box. It is easily avoided by placing a small quantity of a safe bedding or wood shavings in the bottom of the nest box. Alternatively, several pieces of paper may be placed in the box for the female to chew into bedding.